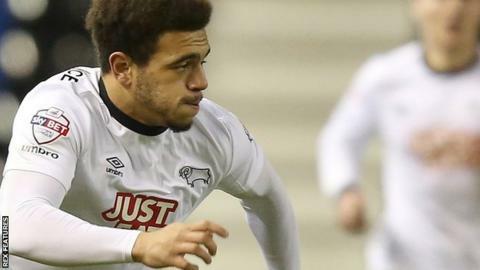 Burton is the ideal place for Derby County loanee Mason Bennett to develop, according to Brewers boss Nigel Clough. When the 19-year-old last played under ex-Rams manager Clough, he became Derby's youngest first-team player at the age of 15 years and 99 days. Since Clough left Derby in September 2013, the striker has had loan spells at Bradford and Chesterfield. "He has matured a little bit and you see that on the pitch. The spell here will only help that," Clough said. Bennett has found first-team opportunities at Derby limited following Clough's exit - making 12 appearances under Steve McClaren and none under his successor Paul Clement this season - and he scored just once during his loan spells over the past two seasons. Clough feels that the familiar faces at League One leaders Burton - with former Derby coaches Gary Crosby and Andy Garner back at Burton with the manager - will help the teenager. "It is ideal coming here because we know him and he knows us," Clough told BBC Radio Derby. "Even if he is coming off the bench, we will look after him and he knows that he will get an opportunity at some point." Bennett came off the bench to make his Burton debut in their 2-0 win over fellow highflyers Coventry City last week. "What we saw on Saturday is we have an ideal replacement if Stuart [Beavon] needs rest within a game or can't start a game," said Clough. "Mason came on, knocked a few people over and was a handful. he showed his pace and power and did everything we hoped he would do."